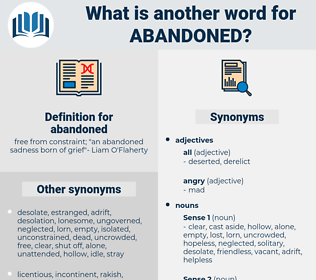 What is another word for abandoned? relinquished, Renounced, Forsworn, discontinued, Forgone. disused, forfeited, Shelved, disposed, Forgone, decommissioned, drop-out, foregone, unused. Ceased, Abolished, removed, cancelled, Canceled, Abstained, suspended, terminated, conceded, departed, stopped, jettisoned, Eliminated, evacuate, dismissed, Vacated, resigned, marooned, Fled, retired, Refrained, Refused, halts, engaged, rejected, scrapped, Denied, ended, Disallowed, lost, halted, Detained, defeated, Declined, handed, failed, Skipped, moved, Gave, shut, agreed, split, Delivered, lifted, turned, exited, Disproved, Allowed, Wavered, blocked, derived, Ditched, pulled, Deposited, deposit, Shifted, out, Fought, released, Waged, let, Jumped, Shipped, Supplied, planted, Walked, Caused, Got, forfeited. abandonned, withdrawn, Disbanded, banned, Ceased, Abolished, removed, cancelled, Canceled, ignored, suspended, disregarded, terminated, stopped, jettisoned, dismantled, Disappeared, Eliminated, evacuated, dissolved, dismissed, declared, Avoided, discouraged, Vacated, bypassed, resigned, disowned, Adjourned, marooned, repudiated, Denounced, Fled, Eradicated, Annulled, retired, postponed, Forwarded, destroyed, dispensed, uninhabited, Indicated, Excluded, Displaced, dropped, Refrained, condemned, Refused, engaged, rejected, Betrayed, scrapped, interrupted, Denied, Waived, attended, forgotten, Forgot, ended, Demoted, Omitted, Ceded, Revoked, lost, halted, adapted, Deleted, broken, Detained, Materialized, landed, adjusted, Submitted, Rendered, defeated, Declined, done, dumped, Communicated, handed, exposed, sworn, Sacrificed, severed, reported, Forgiven, given, suppressed, failed, backward, moved, recourse, spent, disrupted, Repealed, laid, Stood, allocated, shut, deprived, overcome, Delivered, lifted, Delegated, entrusted, recalled, Relied, boned, hired, turned, Stayed, exited, changed, thrown, Allowed, overlooked, employed, reversed, gone, Tossed, chosen, Drafted, blocked, Averted, buried, pursued, sidelined, Ned, Been, disapplied, confused, derived, Ditched, pulled, built, Deposited, finished, unaided, Suffered, wasted, stranded, accused, Trashed, separated, expired, Compromised, closed, found, fallen, continued, Returned, grown, missed, Fought, arrested, released, Looked, Passed, exhausted, phased, Recruited, Pushed, let, Jumped, flushed, Shipped, cast, IEFT, Supplied, faced, tabled, Subjected, received, put, run, kept, kicked, remembered, stated, shed, cut, made, disused, forfeited, disposed, decommissioned, forsaken, foregone. derelict, discontinued, desolate, abandonment, orphan. Withdrew, surrendered, Abrogated, left, Quitted, dispensed, dropped, dumped, Threw, discontinued, drop-out. Abdicated, Aborted, surrendered, left, Quitted. curbed, redeemed, checked, moderate, reclaimed, indisposed, temperate, reconditioned, tempered, salvaged, constrained, recovered, restored, rescued, rehabbed, unaccustomed, inhibited, governed, rehabilitated, inhabited, averse, disinclined, restrained, saved, controlled. He had gone back to that life which he had abandoned for her sake; the temptation had been too strong, the desire for vengeance too great. One of the thirty - two pounders had to be abandoned in order to fill up the crew of the gun. abandonment, abundant, appointment, appendant, above-mentioned.